The most talked about EverNote numbers on freemium conversion shows, 3% paying customers and 97% free users (freeloaders and hopefully some Do-Gooders). When a user signs up, if we use priors as an indication of posterior, the probability this user will upgrade to the paid version is 3% (will not upgrade is 97%). 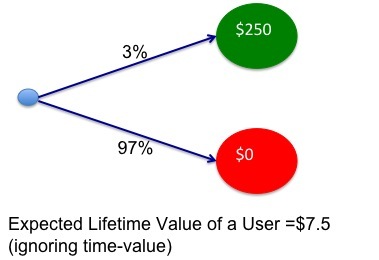 Let us assume the Lifetime Value of a User is $250. Since all the infrastructure costs are sunk and the marginal cost to serve an additional user is $0, there is no cost in serving the free user. So the expected Lifetime Value of this user is $7.5 (3% * $250). Since this a positive value, it would appear that there simply is no downside to sign up another user for free. However, what about users who would have upgraded had it not been for the free version? This could be either due to the $0 reference price or the value they get from free is good enough (See: value step function). This is the opportunity cost. Let us assume the same conversion numbers and assume that an additional 3% would have upgraded had it not been for the free version. The value you would have gained is a forgone opportunity and hence coded as red. This brings the expected Lifetime Value to just $0.225. Model this for different forgone opportunities, does Free look attractive any more? You could argue that not all of the 3% who pay now would not have upgraded had it not been for free. You could argue that it isn’t another 3% that was forgone. You are correct on both aspects. However, if you do not know how many will pay for your product or if your prospects do not value the product enough to pay for the value they get, isn’t that a bigger problem? You are correct that 3% of a large number is a large number. I do not see how free automatically gives access to the entire market – reach-ability is one thing and competition from many such undifferentiated services is another. Successful marketing is about segmentation and targeting – finding an existing customer need and delivering versions at prices the segments are willing to pay for. To me the real value in the free version is the viral marketing aspect of it. If a user is using and hopefully marketing your free version they are growing your audience for marketing you premium version. In simple terms you are making that 3% a larger number because it is 3% of a larger number. Isn’t that the class economic problem where prices hurtle down to the MC when the products are undifferentiated and any one producer has enough capacity to serve the entire market? Not sure. If EverNote had no free option, but a competitor did, mightn’t that competitor get all the users, and all the media attention, etc.? While EverNote would be left with no users at all? I think if people use your free version, then, yes, you’re adding value. You might not be making the same profit. It is implied in the % conversion and LTV numbers. On the other hand if your customers prefer a free version over yours and decide only on price, then are you really adding value? How can you differentiate over the free options? First, did you update your blog design? Looks nice! Doesn’t your analysis change when you take “competition” into consideration? If EverNote didn’t offer a free version, someone else would provide it. Also they can drop it any time when they change their assessment.